As the election is looming around the corner, substantial nationwide numbers of candidates are stepping into the fight. 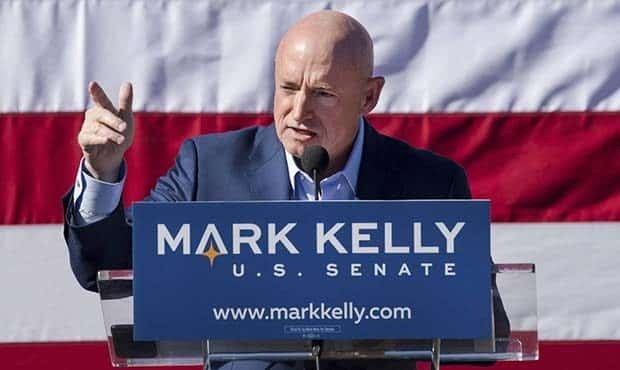 On Sunday, Mark Kelly, the retired astronaut, and U.S. Navy combat pilot, publicly started his bid for Democratic nomination for the 2020 Senate seat in Phoenix. The announcement was in front of a throng of supporters who hope to see him unseat Republican U.S. Sen. Martha McSally. Kelly’s event was held in the parking lot of a downtown music venue, and around 750 people attended the event. There was a similar event in Tucson as well. He was introduced to the stage by his wife, former Rep. Gabrielle Giffords, who survived an assassination attempt at a 2011 constituent event near Tucson, where six people died, and 12 others were injured. Kelly, 55, spoke of his missions to space, his service during the Iraq War and his caregiving to Giffords after the shooting. He also spoke of his advocacy for gun-control measures in the wake of the 2012 mass shooting at Sandy Hook Elementary School in Connecticut. However, Kelly did not detail specific policy ideas during his 16-minute speech. As he started to speak of the effects of climate change on the planet, he got some of the loudest applause from the audience. Jim Oleson, an independent voter from Scottsdale, said he was contented seeing a fresh voice in the political field, calling Kelly a “competent” and “honest” candidate. “This was wonderful for a starter,” said Oleson, 80. Tracey Sekayumpteway, a mom of five children from Chandler, showed up to hear Kelly speak to educate herself about Kelly’s stand on gun control. She also wished to hear his policy ideas on ensuring that young undocumented children brought to the U.S. illegally as children will gain legal status. Sekayumpteway, 38, an independent voter, said she would vote for a candidate who does not care about partisan politics and cares more about making “moral decisions” that will impact generations to come. It should be noted that Kelly started his senate campaign on February 12 with a four-minute video featuring cinematic views of the desert and scenes of him with his wife. The weekend rallies were his first formal campaign events. However, Kelly did not take questions from reporters Sunday. A Republican group allied with Sen. Martha McSally, who is running for election in 2020, hit Kelly with a video aimed at sowing doubt about his Democratic credentials. The National Republican Senatorial Committee, the arm of the party that works to elect Republicans to the chamber across the nation, said that Kelly had shared his views on Democratic policy proposals ranging from the Green New Deal and Medicare for All. According to Public records, Kelly voted in the 2012 Republican presidential primary election while living in Galveston County in Texas. As per a spokesperson of Kelly, he voted for Barack Obama during the 2012 general election. “Which Mark Kelly is running for Senate?” the ad asks, juxtaposing the man who voted in the 2012 GOP primary against the “liberal activist” benefactor of Senate Minority Leader Chuck Schumer. Republicans now hope McSally does not face a primary challenge as she did in 2018. As of now, Kelly is the only Arizona Democrat to announce so far for the 2020 seat. Democrat Rep. Ruben Gallego also is considering a bid. Gallego and his supporters see him as a voice of the more progressive section of the party, and one who reflects the state’s diverse demographics. Gallego, a former Marine who served in the Iraq War, may not announce his decision until the March 12 Phoenix mayoral election ends, where his ex-wife, Kate, is on the fray. It should be reported that the winner of the special election would face re-election in 2022 to serve a full six-year term. Natalie Yardley, a 45-year-old independent voter from Mesa, has been following Kelly’s career from the starting. Yardley said in an interview that she cared deeply about public policy rooted in facts and science, not political ideology. As per Yardley, she wants candidates to have smart discussions about gun control and border security. She also showed her unhappiness with McSally’s appointment to the Senate seat once held by the late Sen. John McCain. It should be noted that McSally lost her 2018 campaign for the state’s other Senate seat to Democrat Kyrsten Sinema.